Sailing Team Building Programs in Annapolis, Maryland! 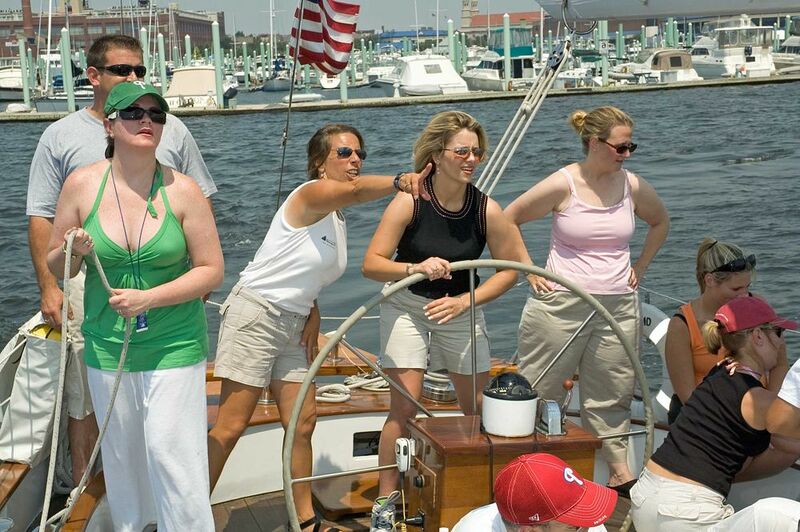 Schooner Woodwind specializes in providing your group with the best and most unique team building sailing experience in Annapolis or anywhere! Our professional captains and crew lead an exciting, hands-on sail training program on the Chesapeake aboard our 74-foot schooners Woodwind and Woodwind II. Our signature team building programs are highlighted below. Click on any one to get to a comprehensive description. If you don’t find what you’re looking for, or require a less intense or more intense team building activity tailored to your group’s specific needs, please call our helpful, experienced team building staff at 410-263-1981 to plan your team building event. Team Fun is perfect for celebrating milestones or building and strengthening relationships. 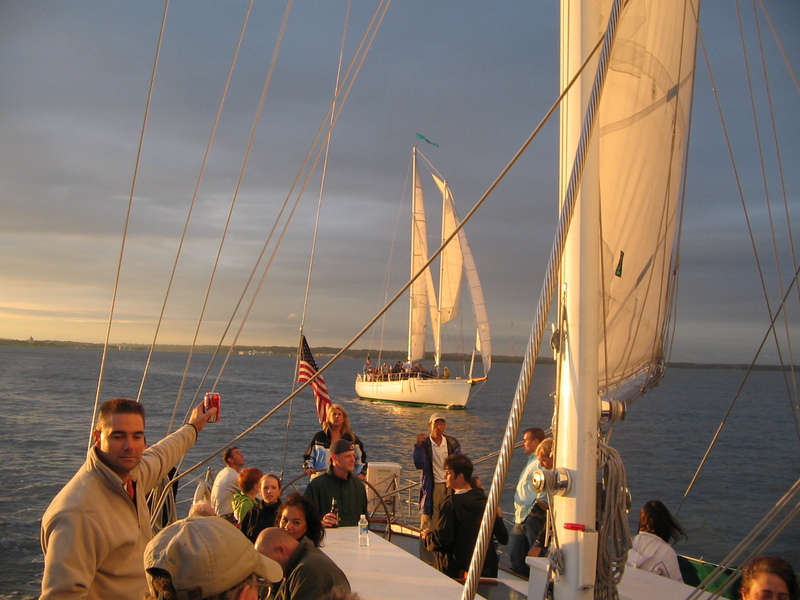 An interactive sail on the Chesapeake Bay is a great way to welcome new members, get to know one another, or reward team accomplishments in an enjoyable atmosphere. The ‘Team Fun’ option offers your group extensive catering options. All of our food is prepared by Palate Pleasers in Eastport, and the menus are customized for ‘Woodwind’, ideally suited for the boat. You may choose from pre-planned combinations such as the ‘Gourmet Gangplank’, or order from our a-la-carte menu. From simple bagged lunches and snacks, to gourmet appetizers and full buffet meals, we can customize your menu to be as unique as your group. Woodwind also proudly serves the best brews on the Bay, featuring 4 microbrews from the local area, as well as 3 choices of wine from our onboard bar! And don’t forget the Woodwind specialty drink! This exciting and interactive experience is ideal for building the core skills that create a high-performance team. Increase awareness of your team process. Learn how pressure stimulates teamwork. Understand how leadership is applied in a team environment. Your team will be divided into smaller groups to learn the basics of sailing, communication, and teamwork. After training, the entire team will work together to sail and successfully navigate around a course. Take your teamwork to the next level! 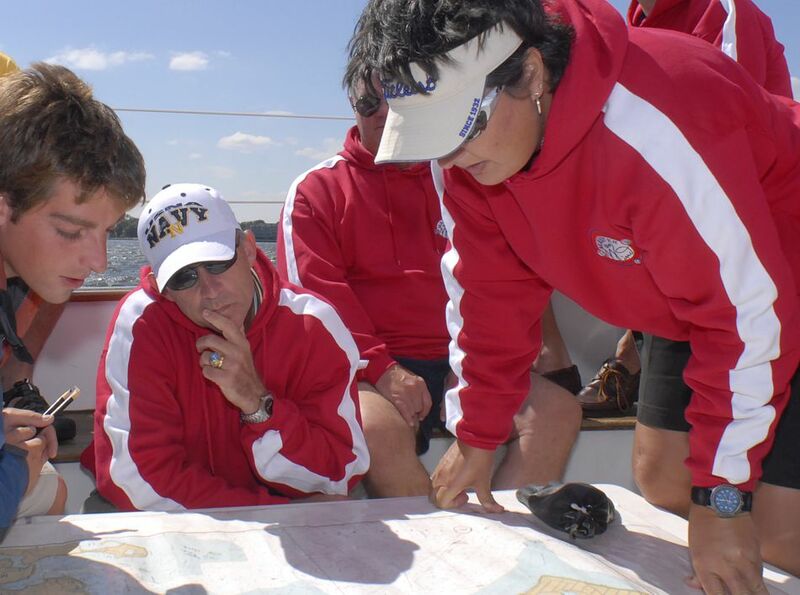 Learn sail-training from our professional crew and set exciting goals to challenge your team. The “Challenge” is ideal for groups looking for a high level team building program, but who may not have the numbers (or the budget) to go for the “Ultimate Team Challenge”. 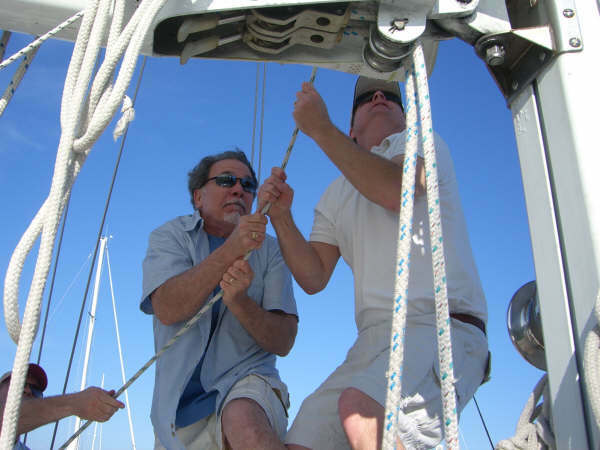 Experience hands-on sail-training from our professional crew, including all the fundamentals of sailing from sail trim to helming and navigation. 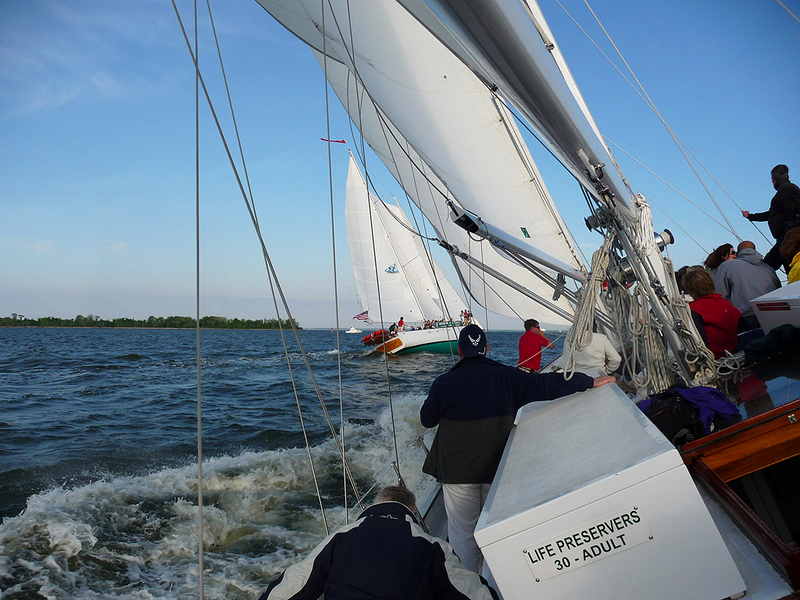 Enhance your group’s teamwork while enjoying a spectacular day sailing the Chesapeake! The challenge begins as soon as Woodwind leaves the dock, as your team is called to action to help raise the sails, right in Annapolis Harbor! Once under way, the captain will give a brief overview of how to sail a schooner. The crew will then assign your group to four stations, each responsible for learning a different skill. Two stations will trim sails, one manning the staysail and jib, the other controlling the fisherman sail. The third station will learn basic navigational skills, from taking a ‘fix’ to see where the boat is on a chart, to plotting a course and using a compass. The ‘Nav. Team’ must communicate directions to the last station, the ‘Helm Team’, who will learn how to steer Woodwind. 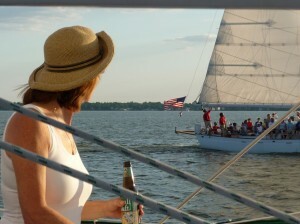 At the conclusion of the training program, your team as a whole must work together to sail Woodwind back to Annapolis! Two teams on identical schooners go head-to-head in an exhilarating, fun, and interactive ‘America’s Cup Style’ match race for the entire group. Awaken your team’s competitive juices, as everyone works together to be first over the finish line. Each team will be divided into smaller groups for an intensive sail training and teamwork session. This teambuilding program has the biggest challenge, where the best teamwork wins. Most unique and challenging team building program anywhere! 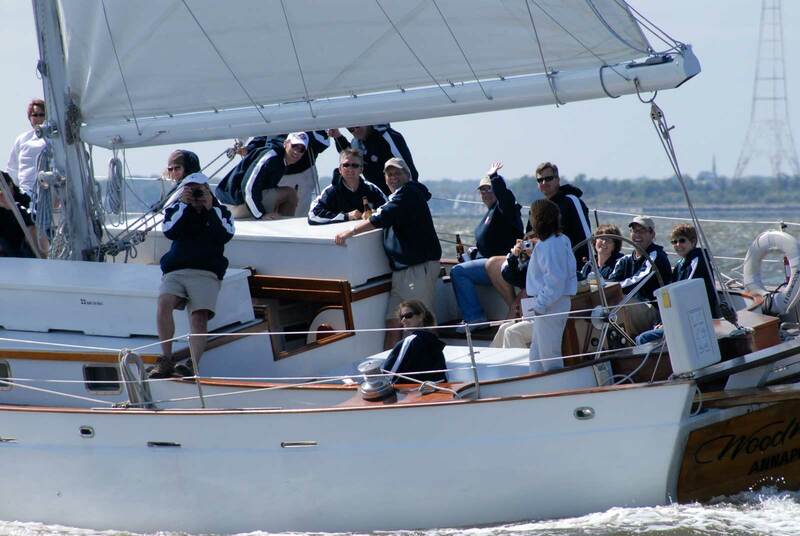 Your group will match race our two identical schooners, Woodwind and Woodwind II – in the only place in the world to offer such a program, Annapolis, Maryland! The anticipation mounts as teams are picked and begin boarding each boat. After a safety briefing by the captains, the Woodwinds depart the dock together, each anxious to finish first. Your team is immediately called to action to hoist the sails right in the harbor! Want a program less intense? Read about our Team Fun Program. The first half of the program involves an engaging sail training session with our crew. Each team is assigned to one of four stations aboard each boat. Two stations will learn how to trim sails, one will handle the jib and staysail, the other the fisherman sail. The ‘Nav. Team,’ the third station, will learn how to find out where the boat is on the chart by taking a “fix” and then they’ll learn how to plot a course and communicate this information to the last station who will learn how to steer these 74-foot schooners! Coordination and cooperation are essential to sailing these boats efficiently, and communication between each station is a must. Your team will select a ‘Captain’ who will facilitate this communication, and lead you to victory! Our crew prides themselves on being friendly and informative teachers. After a short break and a briefing by the captain and crew on racing tactics, the program’s second half puts your team in control as you race for glory! The race is a match race, testing the newly acquired sailing skills of your teams. Efficient teamwork and communication is key to a successful race, and the team that cooperates best will be victorious! Cooperation, teamwork and communication are essential as your group must work together to sail ‘Woodwind’ back to Annapolis. 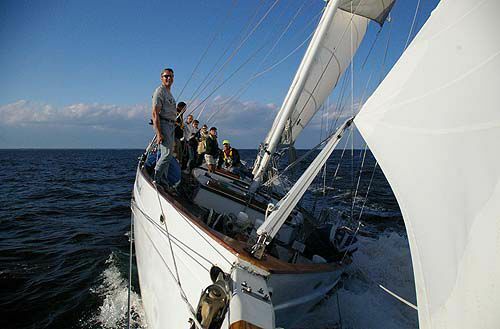 At the conclusion, your group will have gained a new appreciation for teamwork, while sailing aboard one of the most beautiful sailboats on the Bay! Experience a match race pitting Woodwind vs Woodwind II. The super-competitive crew will race the boats for your entertainment, offering a rare chance to see a true big-boat match race firsthand. Help raise the sails, and take part in helping your team win! Introduction to the core elements of sailing, teamwork, race strategy and racing tactics while sailing. Your team gets to watch a true match race—our crew competing for your entertainment. This trip is ideal for groups who want to experience the excitement of a match race and observe outstanding teamwork in action, with a less hands-on and intensive sail training program. Experience an ‘America’s Cup-style’ match race while watching from aboard the boats! 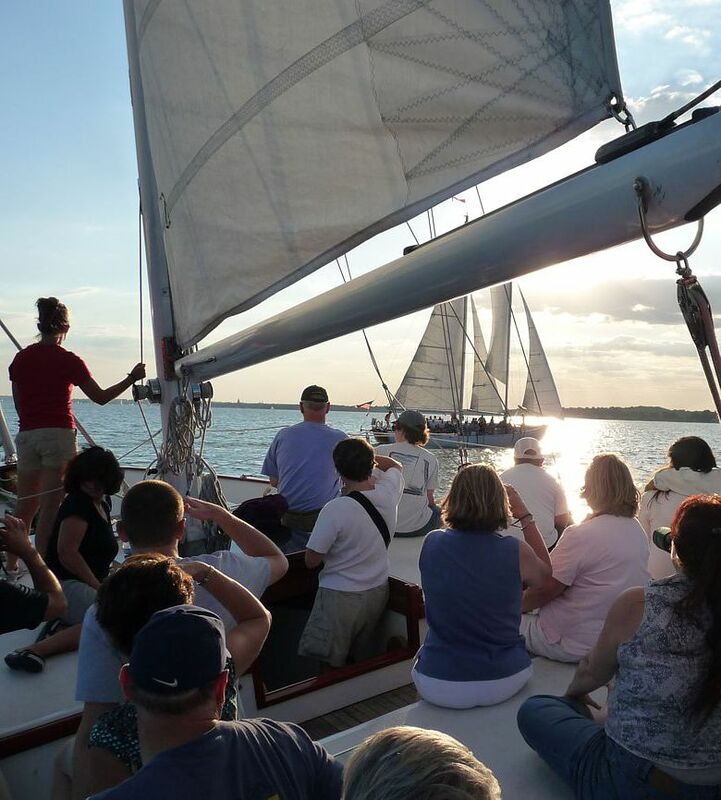 Enjoy all the thrills and excitement of a real match race between two of the Chesapeake’s fastest sailboats while relaxing as an on-board spectator! The Crew Match Race pits Woodwind vs. Woodwind II in an America’s Cup-style race, with our professional captains and crew in control. Top-notch sailing, awesome social experience! Experience the true performance of our fantastic yachts, and revel in the teamwork and coordination of the crew. Crew Match Races are super competitive, offering guests a rare chance to see a true big-boat match race firsthand! Learn about race tactics, strategy and crew teamwork as the boats sail around the course! This team building activity is ideal for groups who want to experience the excitement of a match race and observe outstanding teamwork in action, with a less hands-on and intensive sail training program. We can accommodate up to 96 people on both boats; an excellent opportunity for larger corporate groups to experience the thrill of sailing in a real match race, while enjoying a great social atmosphere! We have several additions to our team building programs that will make your trip truly unique! Please call our helpful, experienced team building staff at 410-263-1981 to plan your team event.